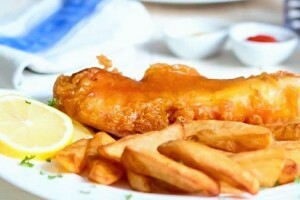 Join us at KitchenAble on Tuesday, March 15th, at 6 pm where you will learn to prepare the classic pub fare Fish and Chips. Our menu will include: Our famous (and delicious) double-fried “Chips” (aka French Fries), Beer Battered Fish Fillets (made with wild caught, local fish), Tartar Sauce, Curry Ketchup, Cabbage Salad, and Lemon Shortbread Cookies for dessert. We’ll provide a cup o’ tea but be sure to bring your own Guinness or Hard Cider if that is what you prefer to drink at the pub. Cost of class is $40 and included in the fee is a recipe packet and a full meal of the dishes prepared in the demonstration. Chilled water and coffee are available; guests are welcome to BYOB if you wish.